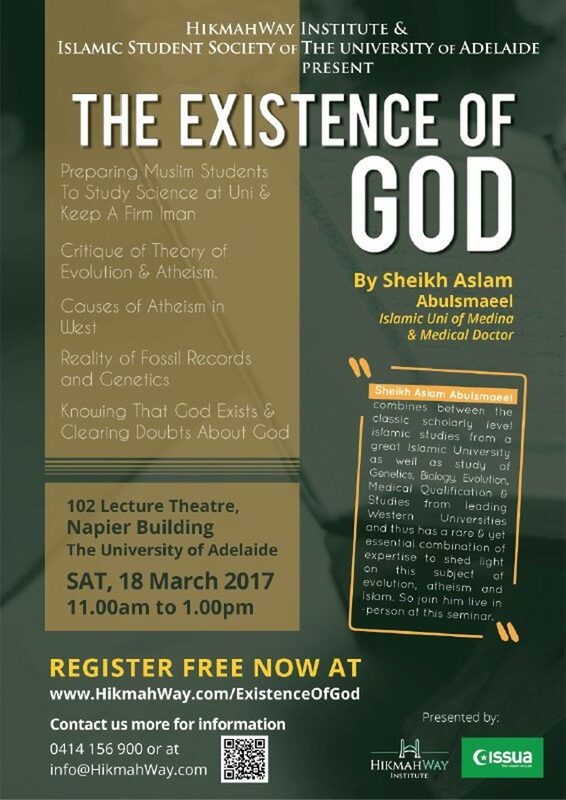 HikmahWay Institute with Islamic Student Society of ISSUA present a 2 hours, free entry, course on the topic, The Existence of God, and will be presented by Sheikh Aslam AbuIsmaeel. Sheikh Aslam AbuIsmaeel, along with his broad knowledge in the religion and medical field. Critique of Theory of Evolution & Atheism. 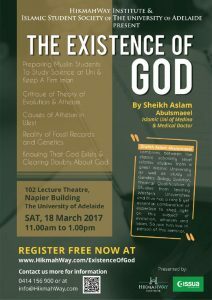 Combines between the classic scholarly level Islamic Studies from a great Islamic University as well as study of Genetics, Biology, Evolution, Medical Qualification & Studies from leading Western Universities and is thus one of the highest suited in the world to talk on this subject from an Islamic and natural sciences combined background.